Unknown. Ashleigh had been living with her maternal grandparents on the Westside of Kelowna, British Columbia. 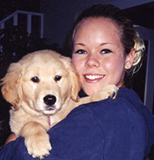 She went out on June 1, 2005 with friends in a vehicle and never returned home. She was last seen in City Park, Kelowna, British Columbia, Canada on June 5th, 2005. Her whereabouts remain unknown and her case remains unsolved.